Rows of Gondolas lined up on the Grand Canal in Venice, Italy, ready for tourists to have a ride on the famous waterways of this floating city. 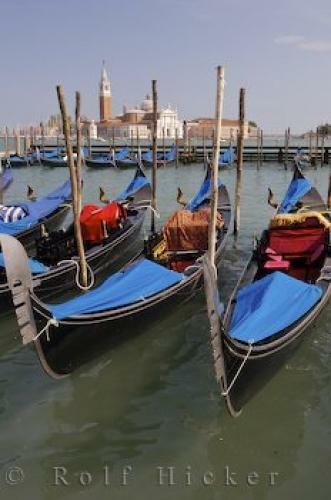 Gondolas are synonymous with Venice and they have long been a symbol of this historic region. Gondolas moored on the edge of the Grand Canal in Venice, are ready for tourists to come and pay for a tour around the waterways of this famous city. There are many iconic images of gondolas on the water in Venice and this method of transportation has become one of the best ways to travel around and see the sights. It can be a rather expensive way to travel and is usually saved for tourists only as the locals take the public ferries or have their own boat. But when you are in Venice, you have to take a ride on this traditional rowing vessel. The Gondola used to be the means for everyone to get around the city, but as the tourist industry has grown, so has the demand for this method of sightseeing so it is now reserved mainly for tourists. in Venice, Veneto, Italy, Europe. ... They were most popular around the mid-eighteenth century where it was believed there were about several thousand in operation. In comparison, there are several hundred today. It is quite an undertaking to build a gondola, as they are made from eight different types of wood and 280 different pieces that all have to be assembled in an expert way. They are also not symmetrical, so they have to be built to precise measurements. Gondola's on the Grand Canal in Venice, Veneto, Italy, Europe. I photographed this photo with the digital SLR camera model Canon EOS-1Ds Mark II, aperture of f/8.0, exposure time of 1/80 sec. on ISO 100, as always I used a original Canon Lens, the focus lenght for this picture was 35mm.